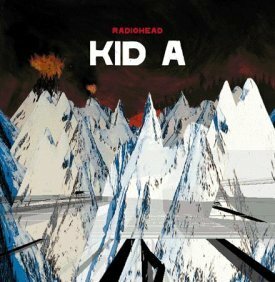 Radiohead releases their fourth studio album, "Kid A"
Kid A is the fourth album by the English alternative rock band Radiohead, released in October 2000. A commercial success worldwide, Kid A went platinum in its first week of release in the UK. Despite the lack of an official single or music video as publicity, Kid A became the first Radiohead release to debut at number one in the US. This success was credited variously to a unique marketing campaign, the early Internet leak of the album, or anticipation after the band's 1997 album, OK Computer. Kid A was recorded in Paris, Copenhagen, Gloucestershire and Oxford with producer Nigel Godrich. The album's songwriting and recording were experimental for Radiohead, as the band replaced their earlier "anthemic" rock style with a more electronic sound. Influenced by Krautrock, jazz, and 20th century classical music, Radiohead abandoned their three-guitar lineup for a wider range of instruments on Kid A, using keyboards, the Ondes martenot, and, on certain compositions, strings and brass. Kid A also contains more minimal and abstract lyrics than the band's previous work. Singer Thom Yorke has said the album was not intended as "art", but reflects the music they listened to at the time. Original artwork by Stanley Donwood and Yorke, and a series of short animated films called "blips", accompanied the album. Kid A has been considered one of the more challenging pop records to have commercial success, and it polarised opinion among both fans and critics. The album won a Grammy for Best Alternative Album and was nominated for Album of the Year. It also received praise for introducing listeners to diverse forms of underground music.